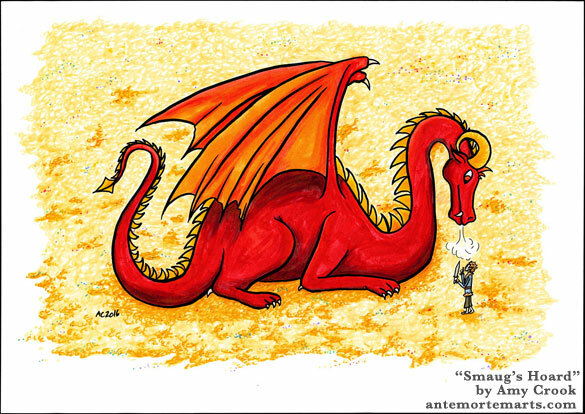 The tiny hobbit burglar is trying to keep himself quiet, but he’s been found by the big red dragon protecting his hoard. Smaug’s surrounded himself with gold and gems on every side, piles upon piles until there’s nowhere to go that Bilbo doesn’t set of a cascade of sound. 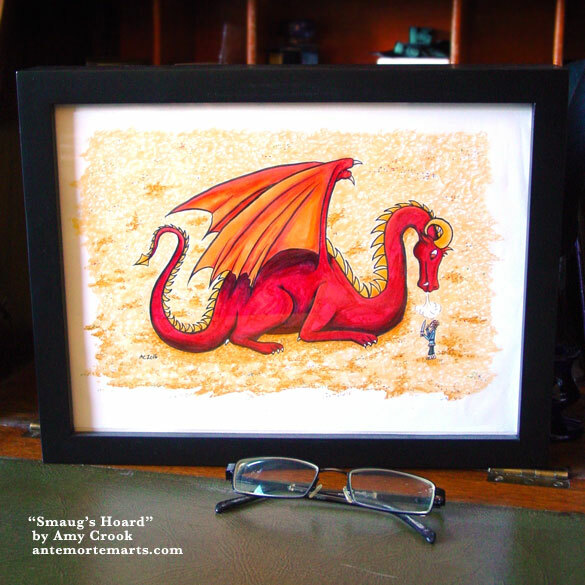 Smaug is a glory of reds and oranges among his shining treasures, and he looks a bit like a cat with a mouse as he huffs warm breath over the wee hobbit. This piece is an unusual size for American, but perfect for those with sensible paper sizes — A4 is not quite letter size, and you can find frames for it at Ikea. 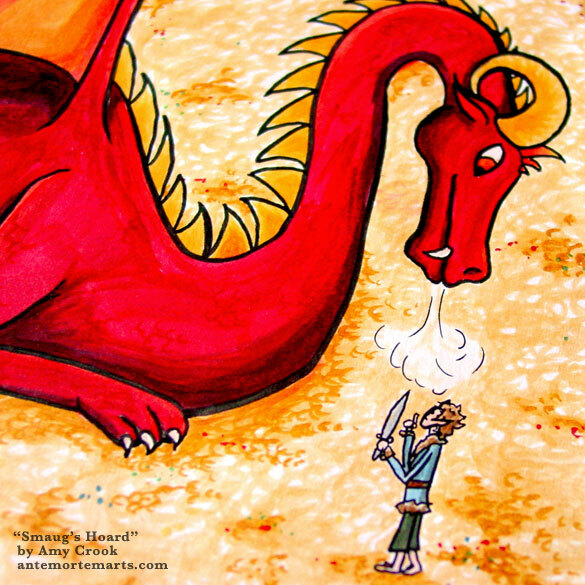 Above, you can see tiny Bilbo getting huffed at by a big red dragon. 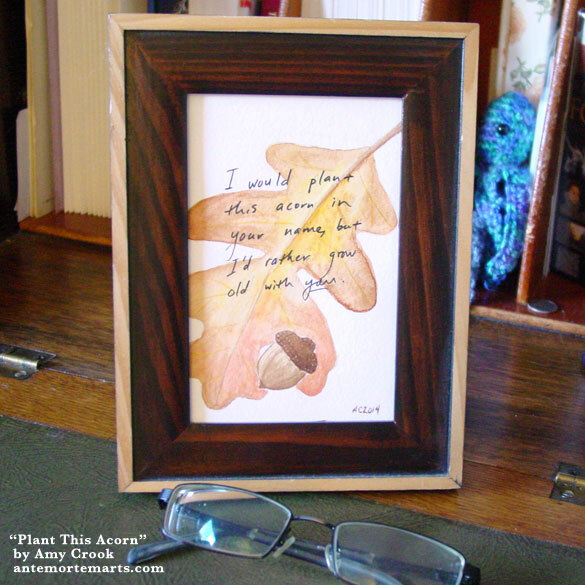 Below, the piece snuck like a burglar into a 9×12 frame so you can imagine how it would look in your own hoard. It’s dangerous to make comments about hobbits in the presence of Jo … she might go and commission some art for you. This adorable comic is for a couple having a baby, who have been self-described as two dwarves who wish they were a hobbit and an elf. Thus, we have a dwarf-decorated crib with a hobbity dwarf on one side, and an elfin dwarf on the other. 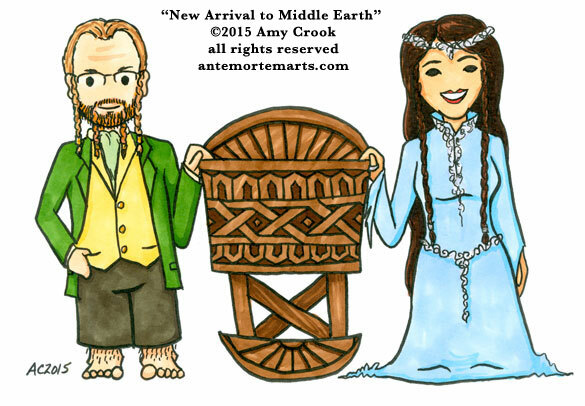 New Arrival to Middle Earth, 7″x5″ pen & ink and Copic marker on paper. I imagine that whoever Bilbo was walking past thought they were paying him a compliment when they told him he looked just like a bilberry. 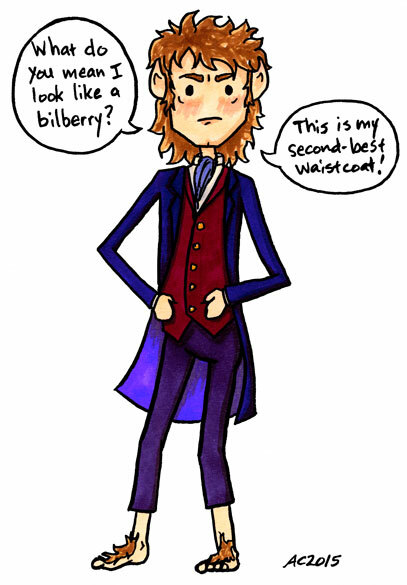 Unfortunately, Bilbo disagreed despite the fact that he’s dressed in blue and purple with his lovely red waistcoat, just like the inside of a ripe bilberry (a relative of the blueberry). 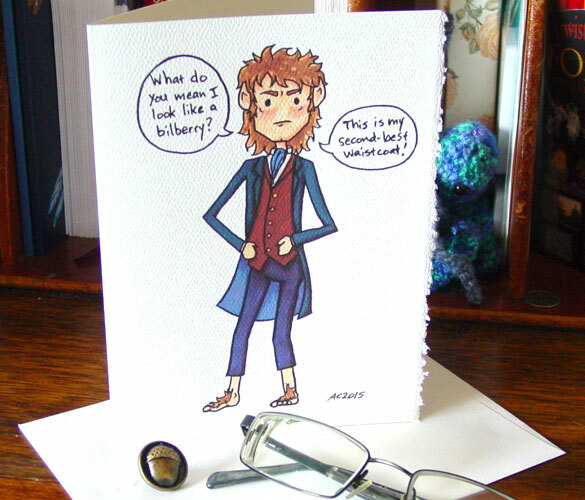 This grumpy hobbit already has a new home, but you can get a card with which to amuse your friends at my Etsy shop. Bilberry, 5″x7″ pen & ink and Copic marker on paper. 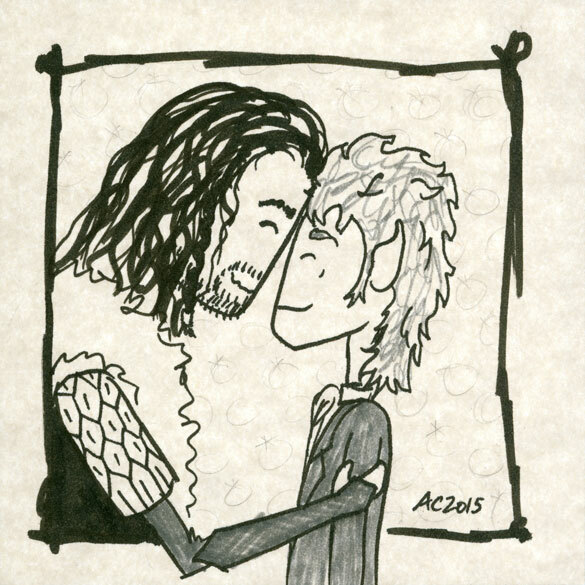 Thorin’s being affectionate with his burglar in this little doodle, with some mysterious sparkly bubbles in the background because reasons. Texture reasons. I had some extra square bits of paper, and rather than chop them up into bookmarks, I decided to sketch on them! This is the first of four, well, two that are done, and two that still need to be done. Affection, 4.25″x4.25″ pen & ink and pencil on parchment cardstock. 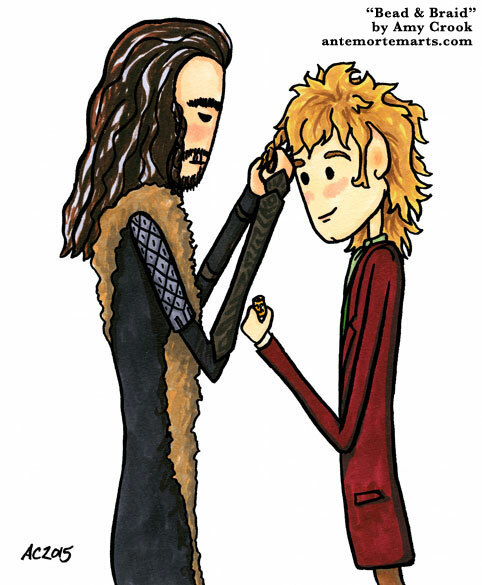 For Wednesday we have an adorable moment that needs no words, with Thorin braiding Bilbo’s hair while Bilbo holds a suspiciously dwarven bead to go in it. This is one of those simple images that can be as much about friendship as anything else. 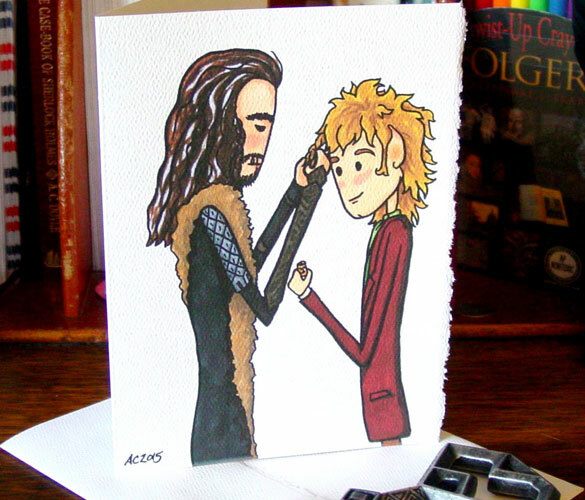 You can pick up this card for your favorite dwarf or hobbit here in my Etsy shop. Bead & Braid, 5″x7″ pen & ink and Copic marker on paper. Speaking of adventures and inspiration, this piece was inspired by The Hobbit movies, especially the newest one, though the quote is my own. 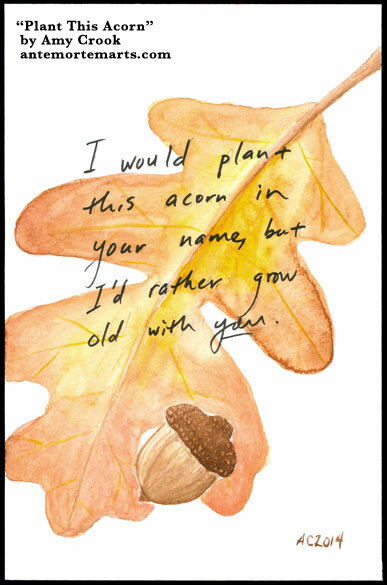 I would plant this acorn in your name, but I’d rather grow old with you. I went for simplicity in this painting, layering glazes in shades of brown, gold, and a little red in the leaf, a little green in the body of the acorn. The writing is a version of my own handwriting. It is meant to evoke both nature and sentiment, a connection to the earth and trees but most of all a connection to a loved one. 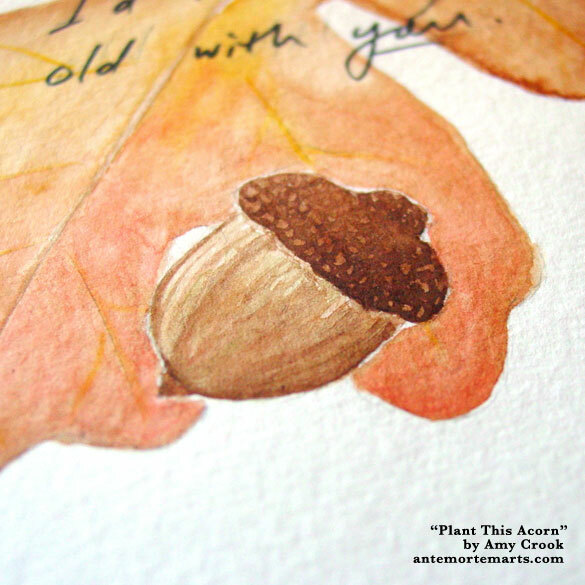 Plant This Acorn, 4″x6″ pen & ink and watercolor on Fluid watercolor paper. Above, you can see the acorn with its little touches of green in the brown, against the red-brown of the oak leaf. Below, I’ve slipped the piece into a warm wooden frame, all ready for its new home. 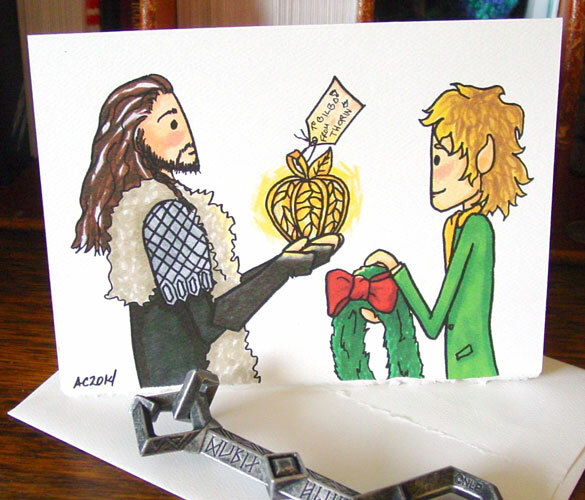 Thorin has a beautifully-wrought golden lantern in the shape of an apple for his Burglar for Yule. 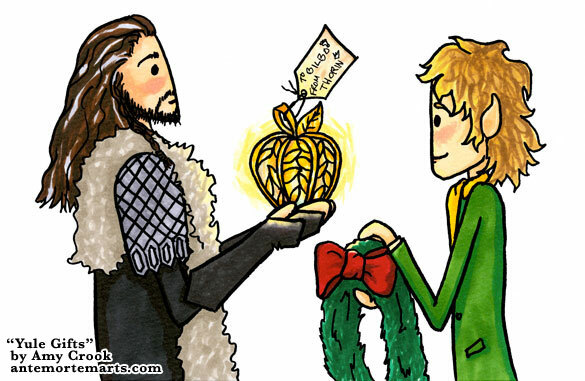 Bilbo has made a very hobbity wreath of fresh evergreens for the King Under the Mountain. They both have the cutest blushes from knowing that the other person thought of them for the winter holidays. You can send this adorable holiday card and spread the yuletide cheer, just pick one up at my Etsy shop! Yule Gifts, 7″x5″ pen & ink and Copic marker on paper.